I'm not the only person who was impressed with KaSandra's awesome credentials. Wisconsin not only gave her a handsome scholarship, they also featured her in their annual, "the Gargoyle." 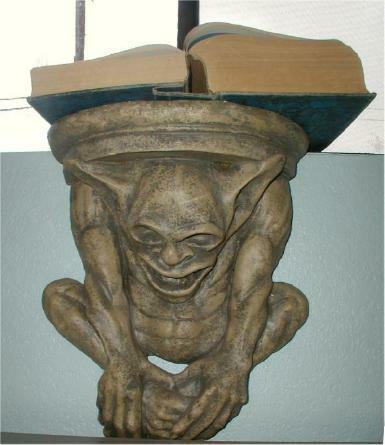 I'm very fond of gargoyles.In fact, Herbie's been holding my dictionary since 2001. In September 2008, KaSandra was the student rep at Wisconsin's table, and joined me for dinner. 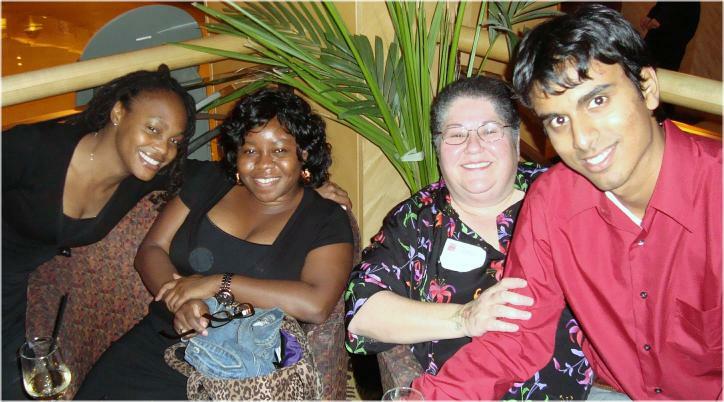 Victoria (a/k/a/ Queeney) and Kunal also joined the party. 2009 Update: Now that KaSandra has finished with her bar exam, she's working with Pepper Hamilton in Philly. 2010 Update: KaSandra's still batting a thousand. Pepper Hamilton featured her in their diversity pamphlet. Soon there'll be more pictures of her on my website than there are of me! 2011: When client Karl toured the east coast to look at law schools, KaSandra's mom opened her home to him, and her brother is interviewed on my web page about entertainment law. How grateful I feel to have met this wonderful family. 2017 update: KaSandra is now making a name for herself defending pharmaceutical companies from liability suits at a major law firm.